Many installations crash because a hidden dialog is waiting for an entry unnoticed by the user. The hidden windows blink only for a short time in the taskbar and can be easily overlooked. By default, an application waiting for an input blinks only for a short time in the taskbar and waits for 200 seconds for the liberating click. This is more than three minutes. Ensure that a window waiting for input is quicker to get the attention of the window control and brought to the foreground. This is done through the registry. In Windows Vista and 7, type ‘regedit’ in the search field of the Start menu, press [Enter] and confirm the user accounts control dialog. In Windows XP, fi rst open the command window through ‘Start | Run’ and enter the command in it. After pressing [Enter], you have to make another confirmation here. In the registry editor, navigate to the ‘HKEY_CURRENT_USER\Control Panel\Desktop’ key. 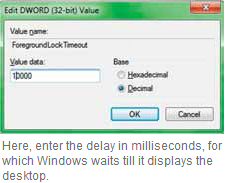 For editing, double-click the ‘ForegroundLockTimeout’ DWORD value on the right. Set the base to ‘Decimal’. Then define the value. It gives the desired waiting time in milliseconds. However, you shouldn't set it to ‘0’ because then every window waiting for an input will spring to the foreground and will disturb you when making an input in another window. For example, try out ‘10000’ for a waiting time of 10 seconds and confirm with ‘OK’. This way, you can mostly type a word or value till the end, and you need not wait for a long time for an installation. The setting becomes active immediately after closing the registry editor.